He was born on April 18, 1964 in the Orlyanka village in a worker and peasant family. He graduated in Art and Design from the Enakievo technical school in 1989. 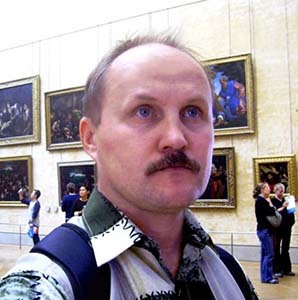 He worked in the interregional company “Ukrtorgreklama” in Zaporozhye from 1989 to 1992. His first cartoon was published in 1985 in the Komsomolets Zaporozhya newspaper. His works also were published in the newspapers such as Nova Tavriya, Vesely Visty (Kiev), the Fountain magazine (Odessa). He is a participant of more than 50 cartoon competitions (all-Union — 3, international — 52, national — 4). He is a prize-winner in 7 cartoon contests. He held a solo in Energodar in 1994 and in Zaporozhye in 1993, two exhibitions in Vasilievka in 1997 and 1998, and an exhibition in Zelena Gora (Poland, the Point gallery) in 1995. He published 4 author’s collection of cartoons (Cartoons by Zinoviev Alexander, 1996, 1997, 1998, 2000). He is an organizer of the Vasilivsky Veselini international cartoon contest in 2011, a organizer of the exhibition hall in Vasilievka. Member of the European Cartoonists Association of FECO (Belgium, Brussels). Now he is a private entrepreneur and a free artist. Prizes: Diploma of Korea (Seoul); 2 diplomas, Israel (Haifa)’ the prize of the All-Ukrainian competition (1999, theme: Business), the grand prize in the SETYRICON 2011 competition. Moscow (theme: Electricity network), the diploma of Croatia.